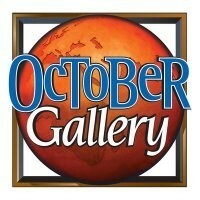 Over the years, many artists have played a major role in the October Gallery story. One such artist was Andrew Turner. Andrew Turner was born in l944 in Chester, Pennsylvania. He was a graduate of Temple University’sTyler School of Art. His work has been featured in numerous solo exhibitions and group exhibitions in the United States and abroad. He taught art in grades K-12 in the Chester, Pennsylvania Public Schools and in correctional centers. His appointments include Artist-in-Residence and Curator, Deshong Museum, Chester, PA; Lecturer, Widener University; and Lecturer, Institute of Contemporary Art, University of Pennsylvania, Philadelphia, PA. He also toured and lectured in The People’s Republic of China. Collectors who hold Turner’s paintings include Woody Allen, Dr. Maya Angelou, ARCO Chemical Company, Bell Telephone Company, Dr. Constance Clayton, Will Smith, Danny Glover, Mr. and Mrs. Bill Cosby, Edie Huggins, Eric Lindros, Mr. and Mrs. Louis Madonni, Moses Malone, Penn State University, the artist formerly known as Prince, Mr. and Mrs. Harold Sorgenti, Swarthmore College, Mrs. Marilyn Wheaton, and Widener University’s Deshong Museum, just to name a few. His Philadelphia commissions include: WDAS FM (1996); Marco Solo, (written by J. Schwinn and G. Harlow, illustrated by Andrew Turner) Reverse Angle Productions, Inc. (1995); and Robin Hood Dell, Fairmount Park (1985).